Sarees are the dearest things hold by every woman close to their heart. Their drapes, mysterious pleats, dreamy pallu, designer blouse to match up, catchy prints and creative patterns are few features or say advantages sarees have over other type of ethnic wears. We know that sarees grab the keen interest of every other woman in not only India but also around western countries. And prints are main fascination which draws attention to every lady but still there are some specific prints and designs which can actually make your day like a blast. Monsoon has already entered from the door and you’re still thinking of ‘how to welcome it properly’? Floral sarees for women are perfect to resonate happiness and a chill thrill during the season. Choose subtle yet bright combo of colours for this ethnic wear. Wear stud earrings and georgette saree will be apt for this one. By saying Nature sarees, we mean autumn leaves, wood print, green hues & leaves. Of course this is not all. Think of animals and everything that looks so natural and ethereal comes under this category. Shop online saree for women and if the season says – ‘Autumn’, then you must have this saree in your closet. A contemporary touch is very necessary when you are planning for a jaw-dropping appearance among your peers. 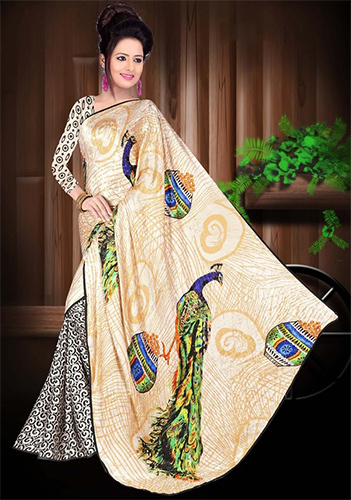 Think of graphic printed saree and you will get the exact awe-inspiring appeal that you were all along craving for. Wear drop earrings and platform heels for a complete look. You believe in little bit raw or tribal style? Then Aztec printed sarees are the best resort for a fashionista woman like you. The abstract and open triangular formations are the basic style which Aztec print displays. Choose them on borders if your body shape is little wider and for lean body, over all Aztec will go well. Calligraphic prints are the new showstopper of the fashion world. Doodling or abstract drawing all come under this category of women ethnic sarees. Try calligraphic saree with light coloured base and dark writing over it. 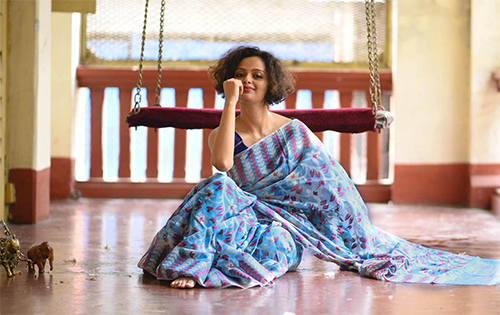 Be it a regional language or some foreign, funny doodles or symbolic trails, this type of ethnic sarees are the new heart throb of every young woman with bombastic creative sense. Complement this look with minimal jewellery and kitten heels.